Pam James is a lifelong resident of DeKalb County. Pam grew up in Rainsville, attended Plainview High School, and currently resides on Lookout Mountain near DeSoto State Park. You may even catch her in her free time riding through the park on her Harley motorcycle. Pam and her husband Mike have 4 grandchildren and an English bulldog named Lucy who they love to spoil. When you can't find her in DeKalb County, she and Mike are more than likely enjoying an outdoor music festival, boating or running a local 5K. Pam recieved her Real Estate License 2001 and received her Brokers license in 2010. 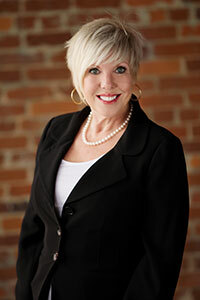 She is a Graduate of the Realtor Institute (GRI), a member of the National Association of Realtors (NAR), and the DeKalb County Association of Realtors where she has served on the Board of Directors as Secretary, Treasurer, and Vice-President. Pam has achieved and maintained Senior Agent status by meeting and exceeding the goals and criteria set by her company. Pam has also earned the Certified Negotiation Expert (CNE) designation. For Pam, past clients provide the highest compliments; referring their family, friends, and associates. Referrals have been the cornerstone of her building a successful business.